Danny Schweers left website work behind in 2016. Here is some of the work he did before then. These project are not that recent, but I am too busy to update this list. The list in the left column is up to date, if you want to explore those links. Biblion Used Books & Rare Finds will open in Lewes, Delaware soon. They had the foresight to get a website up now, even if it is rudimentary. 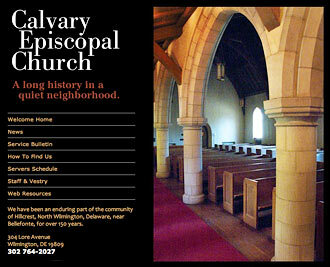 Calvary Episcopal Church, Hillcrest, Wilmington, Delaware, is a small neighborhood congregation with a long history. What they lack in numbers they make up for with heart. Recent album designs for Vectordisc Records. Ray Ferretti's Leaf Juice, The DeFrancesco Brothers' Joey & Johnny, and Ron Thomas's Two Lonely People: Solo Jazz Piano. 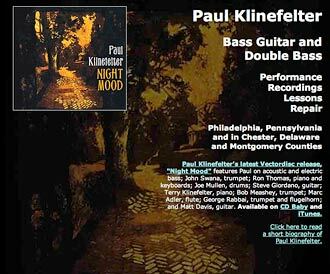 Paul Klinefelter, Bass Guitar and Double Bass. Paul plays these instruments, repairs them, and teaches others to play them. The design of this site is incremental. As I am given new content, the site evolves! Last year I designed his "Night Mood" album on the Vectordisc record label. 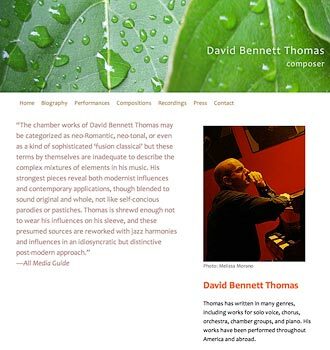 David Bennett Thomas, Composer. This website uses a Flash audio player so visitors can sample David's many recordings and compositions. 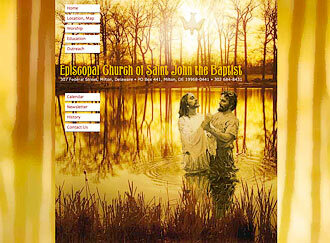 Episcopal Church of Saint John the Baptist in Milton Delaware. The splash page combines two of my photos with a borrowed painting by Two Hearts Design.